I came to discover Orthodoxy during a time in my life where I was very heavily involved in performing and writing music. Growing up as an Evangelical Christian and attending a small liberal arts Evangelical College in Northeast Georgia, I struggled for a number of years with reconciling my involvement in music with my Christian faith. I came to discover Orthodoxy during a time in my life where I was very heavily involved in performing and writing music. Growing up as an Evangelical Christian and attending a small liberal arts Evangelical College in Northeast Georgia, I struggled for a number of years with reconciling my involvement in music with my Christian faith. How does one maintain both artistic and Christian integrity? Was music only a tool to carry a message? What makes music inherently Christian or non-Christian? How does one appropriately bring the totality of one’s Faith into one’s music or any art form for that matter? Why this need to dichotomize everything in the Christian ghetto? Wasn’t there simply a way to just “be’? Couldn’t one simply be a Christian who performs music without apology? These were many of the questions that I had as a young adult. I had experienced a profound sense of the joy of the creative process while writing, performing and recording music with a band of very close friends who were also Christians. Somehow, intuitively I sensed this as a participation in the creative energy of God. I just didn’t have words for it at the time. The problem was that our band never fit the mold in the Christian music industry. We were much more content playing and pursuing music in a mainstream context. We were simply musicians who were Christians and were trying to create something worthwhile and beautiful. It was during this time as a college student that I began to study Eastern Orthodoxy and found that it began to answer some of these tough questions. I found that the emphasis on the Incarnation of Christ stressed the goodness of creation and that now matter is united to God. This means that matter matters and beauty is not just something external to God (i.e. – optional) but an energy emanating from from God Himself – an absolute. I discovered that the early Church rejected anything that divided or separated Christ’s humanity from His divinity. 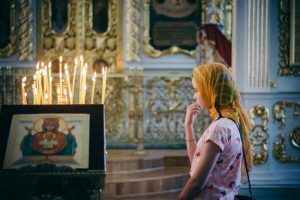 As I learned more about the Orthodox faith, I found that the Orthodox teaching that every aspect of life is sacramental underpinned every teaching of Christ and the Church . This idea that matter matters speaks profoundly to faith as it relates to the creative process. As Orthodox Christians we believe that the Lord is present and fillest all things. Because of the Incarnation of our Lord, now everything CAN become a means of communion with God IF we have the eyes to see it and if we are able to offer up our creativity to God as a priest of creation. This idea is articulated best by Fr. Alexander Schmemann when, in For the Life of the World he says, man’s primary vocation is to be a priest of creation who offers up all of one’s life to God in thanksgiving as we pray in the Divine Liturgy, “Thine own of Thine own we offer unto Thee on behalf of all and for all.” If, as we embark on our creative endeavors, we keep in mind these words of St John Chrysostom, “Thine own of Thine own..” our creative endeavors will themselves become a form of prayer and honor to our creator . Seems easy enough, no? But if we look at the world around us, sometimes even within the church it is clear that we tend to place God in a sphere called “religious” and have ceased being able to see Him in all things. This has caused the world and everything in it to be a closed circuit. Fr. Alexander goes on to say that man, “…does not know that breathing can be communion with God. He does not realize that to eat can be to receive life from God in more than a physical sense.” I think this can be said about the creative process. Whether one is is explicitly “Christian” in one’s creativity or implicitly so, God can still be glorified. The touch point between creativity and faith is the inner disposition of the heart in its relation to giving thanks and praise to God. In short, we must be sure that the Word of God is in our hearts when we articulate our God given creative spirit. Again, seems easy enough, keep God in our heart and we can be sure our creative energy is being used for the glory of God. But to keep God in our hearts at all times requires a number of things, but most importantly it requires us to take a responsible ownership for our faith and our relationship with God. This ownership and faith is first and foremost cultivated through the sacramental and liturgical life of the Church accomplished through participation in a community of faithful. In practically applying the aforementioned ideas of Fr Alexander, in trying to offer up the totality of one’s life in thanks and praise to God, we are greatly aided by the basic task of trying to live in accordance with and fulfillment of the Gospel commandments – the love of god and the love of neighbor. As we allow ourselves to see that our life is and must be one with God we then begin to make greater sense of our worship. 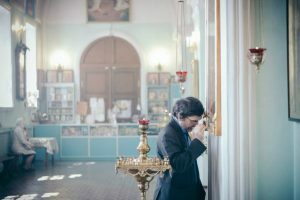 During the Divine Liturgy we sing, ” we praise Thee, we bless Thee, we give thanks unto Thee, and we pray unto Thee O our God.” This includes all of our life – our pursuits, our vocation, our relationships and, yes, our creativity. Let us imagine the priest carrying not only the bread and wine but all of the tools of the creative process in procession at the great Entrance – paintbrush, computer, pen, instruments, etc. Not that we should actually carry other items in the Great Entrance, but rather that we remember that The Divine Liturgy teaches and reminds us that all of life is to be offered up to God in thanksgiving. The bread and wine are the culmination and embodiment of all of our creative endeavors and the fullest expression of our creative tools. Is this not what our liturgy teaches us – how to bring the Life given back to us as food back into the world? 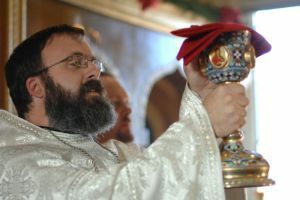 This is what St. Maria Skobstova calls the “eternal offering of the divine liturgy beyond the Church walls” or what St. John Chrysostom call the “liturgy after the Liturgy.” The creative and faithful “priest of creation” is one “who makes of one’s life a liturgy, a prayer, a doxology, to make of it a sacrament of perpetual communion,” as Paul Evdokimov says. The artist, through this God given creativity, has the responsibility to offer up this talent to God and to do something with it like in the parable of the talents. We are to glorify God in everything that we do. Thus to create something beautiful with a spirit of excellence and attention to detail, one can lift up and offer oneself to God. This is really how faith and creativity can converge for the Orthodox Christian. Paul Evdokimov sums it up nicely as a vision for life when he says, “all of life, every act, every gesture, even the smile of the human face, must become a hymn of adoration, an offering, a prayer. One should offer not what one has, but what one is.” We can simply add that for an Orthodox Christian who is involved in the creative process every note, every stroke of the brush, every word must be something offered up in thanksgiving and praise to God as the Creator Himself – the source and origin of all things. Glory to God for all things! Source: “Wonder”: a publication of the Department of Youth, Young Adult, and Campus Ministries of the Orthodox Church in America.